(PhysOrg.com) -- California middle school students using the camera on NASA's Mars Odyssey orbiter have found lava tubes with one pit that appears to be a skylight to a cave. They went looking for lava tubes on Mars -- and found what may be a hole in the roof of a Martian cave. Congratulations are due to the students. I commend them. This is what we need in this country. We need children using and learning about technology and space travel in a hands on manner. Actually allowing children to operate a space based camera on an alien planet really strengthens passion for science. This also give future generations an idea of how difficult this currently is, thus creating a generation of Americans who realize how much we need to improve our space program. Those meddling kids again ... arrrrgh! I wonder what you'd get if you just trained kids to look for archeological sites from ariel views and then just had 1000 students crawl Google earth? pay the children their wages that are owed, you theiving slavedrivers! I would have asked: "Where are valuable mineral deposits likely to occur on mars, from what we know about martian geological processes?" There is an amazing amount of usable data from NASA and others. My son did a science fair experiment using SOHO data, it's really easy to perform basic CME calculations and build a rather good dataset to analyze. One wonders if it's possible to sense the diurnal wind moving in and out to infer the (supposed) cave volume. Doppler radar or lidar might pick up something if there's an instrument available. What an amazing experience for these students. This kind of exposure to space exploration and its technology is priceless in how it can motivate young minds to peruse a career in these fields. With the US lagging so far behind other countries in this respect I only wish every school district had programs such as this available to enhance their math and science curriculum. Its a sad state of affairs when you ask an average high school student "who is Galileo?" and "who is Lady Gaga?" and they think they are both famous musicians. If people wonder why we are falling behind is so many fields, they need look no further than the lack of access to resources, technology, and expertise at the public educational level. This article is a positive example of just what can be accomplished given the opportunity. Sorry to rain on everyone's parade. Credit should go to these people, who found the cave in May of 2007. Luckily I found the link bookmarked and still active. It's not new, it has been found before. "It's not new, it has been found before." Uhh....I can't seem to find one that matches. Which image again? "Sixteen seventh-grade students at Evergreen Middle School in Cottonwood, Calif., found the Martian pit feature at the center of the superimposed red square"
I'm glad they noted that the square was superimposed, I was beginning to wonder why everyone was freaking out about a hole in the ground when there was a gigantic red square carved out on Mars. 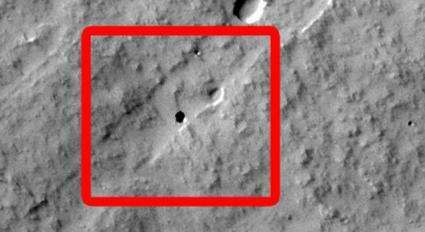 You gave a link to a 2007 blog announcing the discovery of seven 'pits' on the surface of Mars( http://www.planet...0000984/ ). Six images are shown (one contains two pits) labeled A-F. None seem to match the pit shown in this post. So...which image again (A-F)? Who says NASA is a waste of money? This is exactly what we need more of in our public schools.